The RFHP provides a short-term emergency transitional housing with on site supportive services to 45 individuals in the City of Whittier. Services include: on-site health clinic, health screenings, mental health services, on-site meals, case management, clothing, transportation, 12 step meetings, education, training and employment assistance. First Day provides professional and social service offices and meeting space. 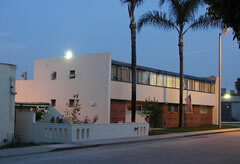 Whittier's First Day was founded in 1989. The coalition offers assistance in four phases. First Day provides professional and social service offices and meeting space. Their Recovery from Homelessness Program includes a 45-person emergency and transitional living facility. First Day offers support to its residents through the Ladder Group.